in Chitty Chitty Bang Bang. 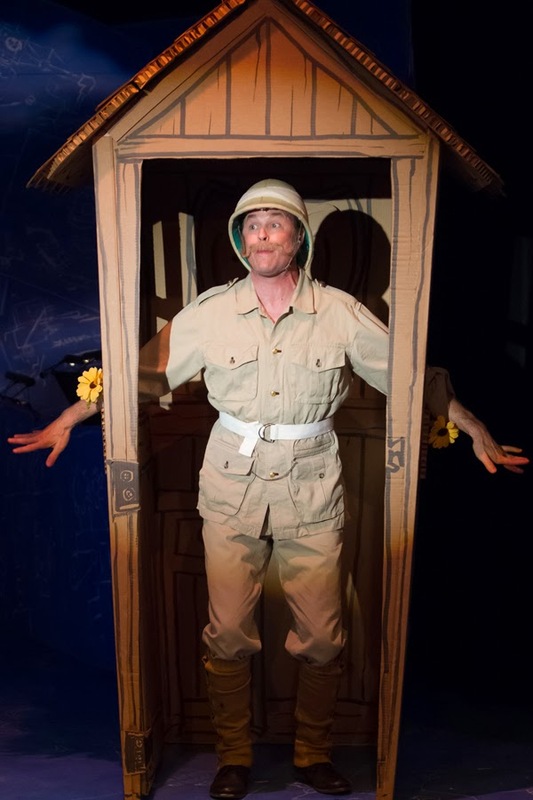 Photo by J. Robert Schraeder and courtesy of The Coterie Theatre. Kansas City friends, I don't hide the fact that I love The Coterie Theatre. I have the fondest memories of visiting as a child for my very first live theatre experiences. I know that early exposure to theatre helped shape my future - and since I now teach about ten-fifteen drama classes each year and participate (when I can) at my community theatre, that's huge! I was so excited when I saw that Chitty Chitty Bang Bang the Musical was on the list for the Coterie's summer show this year. I loved the movie when I was a kid, and had not seen a stage performance of the fairly recent musical adaptation yet. And since the show is about a flying car (and shortened to an approximate 75-minute run time), I thought it would be the perfect show for Lincoln (my vehicle-obsessed kid) to have his first Coterie experience. I actually set up a field trip for my drama students to attend and took a group of about 25 people to the Coterie for this production during opening week. I was surprised that many of my students - Kansas City natives - had never been to the Coterie! Field trips are definitely something I plan to continue, because live theatre is so amazing and every kid should have the opportunity to watch a magical story come to life before their eyes. So, my group of students, their moms, my dad, Lincoln and I took advantage of the Coterie's group rate and saw the show during a preview performance for just $5 per ticket! That's cheaper than a movie, you guys. So worth it. 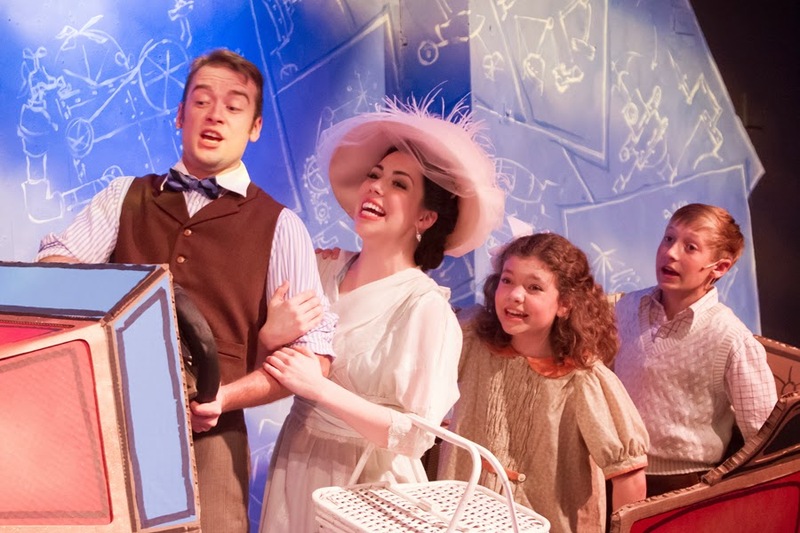 Based on the hit MGM motion picture and featuring The Sherman Brothers' original music from the film, Chitty Chitty Bang Bang receives its Theatre for Young Audiences World Premiere as part of The Coterie's Lab for New Family Musicals, directed by Jeff Church, from June 17 - August 3, 2014. 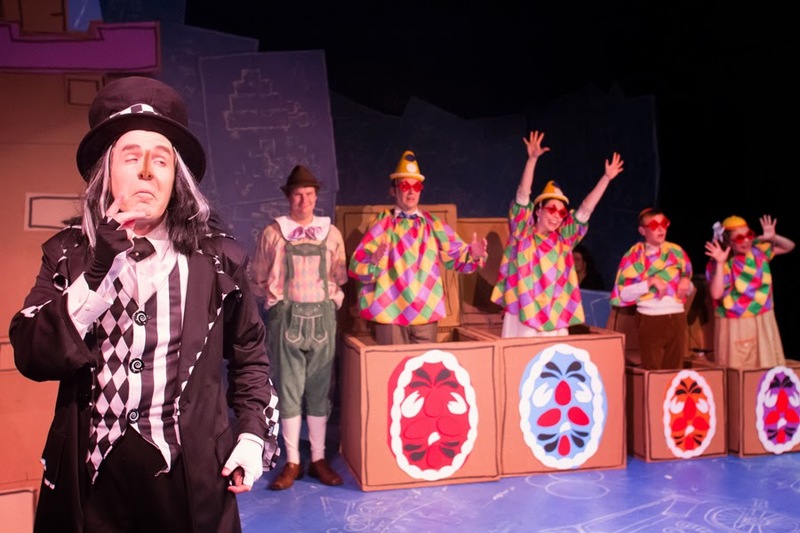 Fans of the movie will not be disappointed by the Coterie's production of Chitty Chitty Bang Bang, because all of the classic moments are represented in this stage version! It's always exciting for me to see how the Coterie has been made over for each new production. The walls were all covered in the mathematical equations of a tinkering mind like that of Caractacus Potts and pulled the piece together nicely. I was a little surprised that the set was comprised entirely of painted corrugated cardboard pieces - Chitty (the car) included! The original stage version of the show featured a hydraulic car, so this was a stark difference. But the beautiful thing was, it worked! Even Lincoln, at age 3, appreciated that while Chitty may not have actual wheels, it was a beautiful car representation. I also loved the cardboard bicycle! Martin Buchanan (as Grandpa Potts) in Chitty Chitty Bang Bang. Having a simplistic set requires the actors to be top-notch quality, and as always at the Coterie, the cast was stellar. They easily handled accents and used imaginative movements to convey pieces of the story that are more difficult to tell onstage. 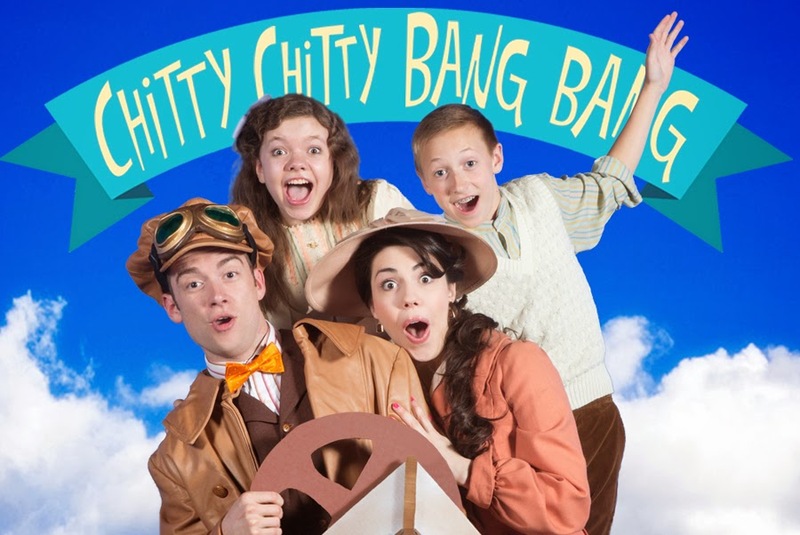 Whether you're a longtime fan or totally unfamiliar with Chitty Chitty Bang Bang, I must advise you to immediately embark on a phantasmagorical adventure and head to Crown Center in downtown Kansas City while there is still time to experience this show! And if you aren't in KC, at the very least find a copy of the movie to watch! Chitty Chitty Bang Bang. Photo by J. Robert Schraeder and courtesy of The Coterie Theatre. 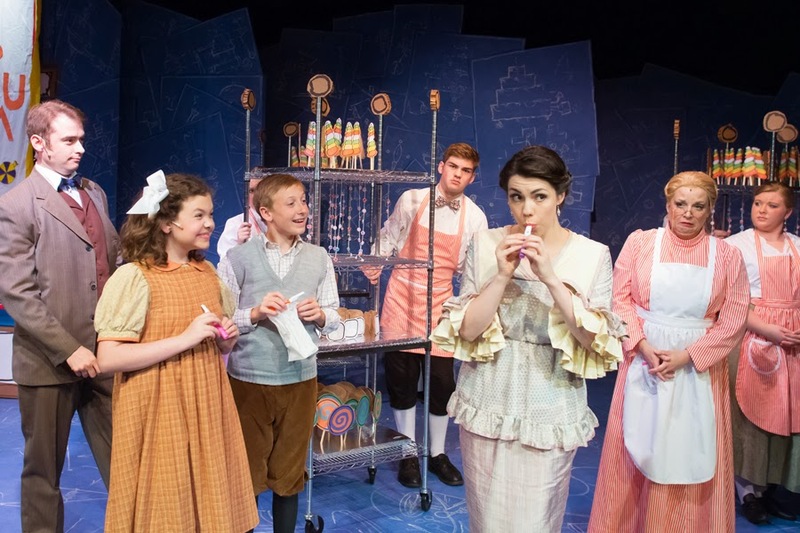 , and Callie Rodina in the ensemble. 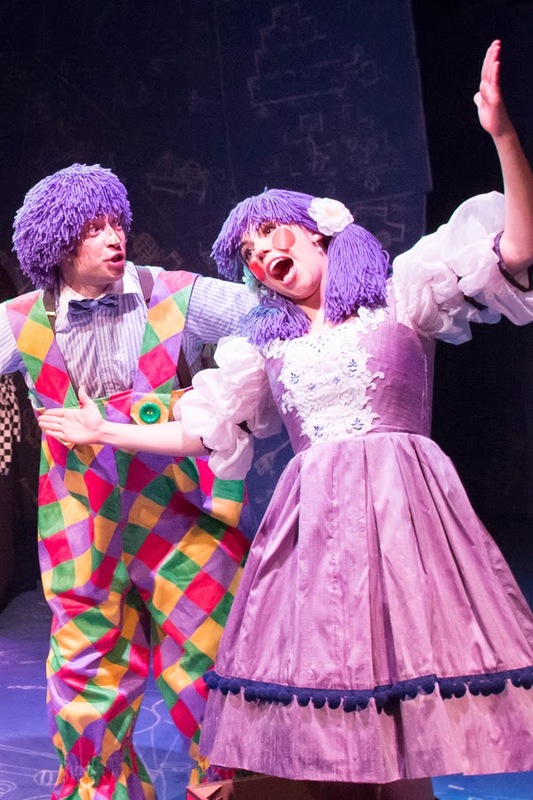 Allison Banks (as Jemima Potts), and Lucas Dorrell (as Jeremy Potts) in Chitty Chitty Bang Bang. The Coterie has employed some artistic liberties with this production. While Chitty is a car that can both float and fly, it's understandably difficult to fly four people around the stage in a car. Director Jeff Church has simplified the idea, and the result is a show that remains completely magical, with the use of just a little imagination. Lincoln talked for days about the "flying car show" - he was enthralled, especially when Chitty "flew" right by our seat. 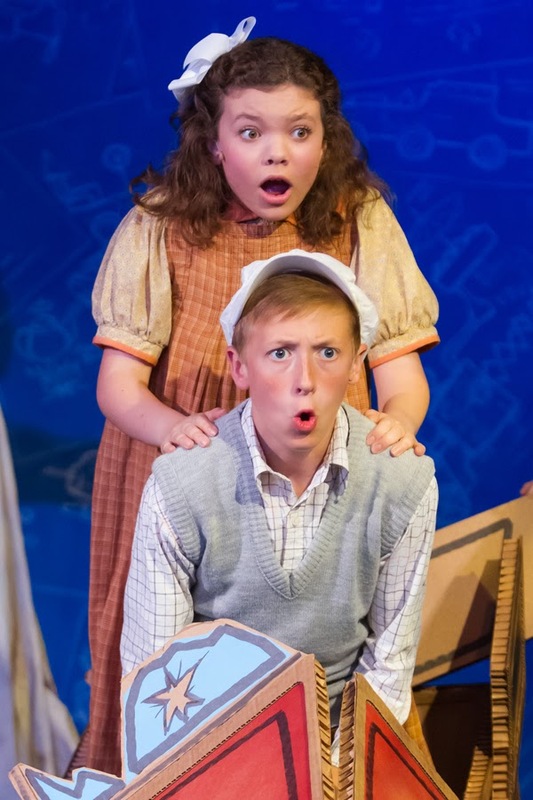 (as Jemima Potts), and Lucas Dorrell (as Jeremy Potts) in Chitty Chitty Bang Bang. The Child Catcher, one of the most frightening kids' movie villains in history (my opinion) lived up to his reputation well - but I thought it was excellent that he never once tried to nab any of the children in the audience, even while threatening Jeremy and Jemimah. Overall, this is just a charming and beautiful family-friendly production and I highly recommend it as a perfect summer activity! Combine it with the Super Kids Save the World free exhibit at Crown Center and maybe a trip to LEGOLAND or Fritz's and you're guaranteed a magical, adventurous day. You can find tickets at the Coterie online. Disclosure: I received nothing for this post and paid for my own tickets to the show. Loved it. Wanted to share. That's it!